Well hi there. My name is Eric Kapraun, son of Lori & David Kapraun. I grew up on Maple Avenue, consider myself a son of Minonk, and will always claim Minonk as my hometown. I moved to Chicago a couple years ago, after finally graduating with my Bachelor's Degree from Illinois State University, to explore career options in this fairest of cities. I saddled up with a brewery almost immediately, obtaining a position more off of the uniqueness of my hometown than any relative brewing experience. The name of this brewery is Half Acre Beer Company, and we craft ales and lagers here in our bunker of a brewery in the North Center neighborhood of Chicago. With the name Minonk in mind, my boss started calling me "Nonkers" as a nickname that stuck... to the point of naming one of our fermentation tanks Nonkers, after my favorite bungalow nestled in North Central Illinois. So with that said, I thought I'd pop on Minonktalk and show you guys the tank sticker. I also selected the city of Minonk to receive a thank you on a beer label, and the beer was released last year. Here are some links for you to peruse, and feel free to stop by and say hi next time you're in Chicago! Girl Scout Cookies for SALE! It is that time of year, Minonk Girl Scout Troop 4761 are selling cookies until March 10th. The cookie choices this year include, Thin Mint, Shortbreads, Caramel Delights, Peanut Butter Sandwich, Peanut Butter Pattie, Thanks A Lots, Lemonades, and new this year Mango. There is also the option to donate cookies to the troops. The cost per box is $4. Most of the cookie flavors are in stock and will be ready for delivery immediately! To place an order you can contact any Girl Scout member or Christine Cunningham at 432-2135 or troop leader Kristie Tjaden. THE DIME STORE IN THE 500 BLOCK NEXT TO THE JEWELRY STORE WAS THE VARIETY STORE WITH ALICE STONEMAN VISSERING AND HER SISTER KATY STONEMAN ROTH. There were several so called "dime stores" in Minonk's 500 block. The store just south of Palmers' Jewery Store was owned by the Van Dorens. It may have been called "Minonk Variety Store" or commonly called "Van Dorens". Boby Golf later operated his donut shop there. In Aug, 1963, I purchased the building and open my TV repair shop, "Spires TV". The "A & P" was the next business to the south of my building. I later purchased that building ot enlarge my business. Years later I sold my two buildings to Glen Carls, in which he operated his grocery business. Ooops! I was wrong. What Scott said was, "The Hornsby's dime store was ~next to~ (north of) Meierhofer's Clothing." What was the name of the dime store (not Hornsby's) that was on the 500 block of North Chestnut and ran by the old ladies. We remember it in the 1950's & early 60's? Scott thinks it was next door to Meierhofer's Clothing. Editor's reply: I believe it was the Ben Franklin dime store. If anyone else has a suggestion, please comment. I like the new updated Minonk Talk website. It seems easy to navigate, responds quickly and provides more information. One thing I did notice that the alumni links for individuals who previously submitted information are all broken. Thanks for the updates and all of your hard work. Editor's reply: The links for classmates shown in a class webpage are broken as the class webpages were designed before the alumni section was updated. It will take some work to try to replace the old links with the new links but hopefully it will get done in the near future. Does anyone know when the Minonk Spring garage sales are going to be? 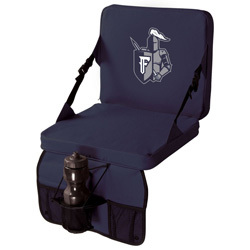 THE FHS BAND BOOSTERS are selling Holloway Benchwarmer chairs with the new logo on them. Cost is $48.00 per chair. 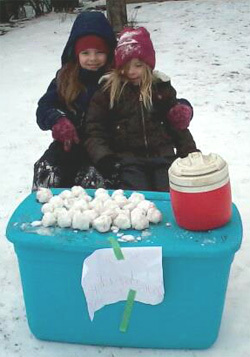 Peri and Lanee Jones took advantage of winter storm "Q" this weekend by setting up a snowball stand. They sold their "pre-made snowballs" for 2/$1.00, but after little sales the first day, dropped the price to 4/$1.00 on Sunday. They made a whopping profit of $4.00 . Thank you to everyone that stopped by and made Peri and Lanee's weekend a little more fun! Minonk Park & Rec Baseball & Softball Sign-Up Reminder. 2013 Baseball & Softball Sign-Up is in full swing! Forms and Information is available on our Website (http://www.minonkparksandrec.com). You can get the info by going to the News Article or Clicking on the Baseball or Softball Links. All Levels Forms except T-Ball are due by March 1st. T-Ball Forms are due by April 12th. Jumbo's Sport Bar and Grill is having an all you can eat smelt, gizzards, fries and coleslaw every Thursday for $7.00. On Friday, February 22, there will be a karaoke and DJ by Main Stage starting at 8:30. Could the store in question be called "The Variety Store?" It was run by the Roth sisters who lived at 236 Locust - now the Tim Samuelson home. They also had a huge cat that stayed in the store usually enjoying in the front window. After the Minonk store closed, one of the sisters worked in the kitchen department/basement at Ensenberger's in Bloomington. I just checked the 1940 census. Alice Vissering, widowed, age 45, is the Proprietor/Owner. She is the head of the family. Living with her are her sister Katie Roth age 49 and brother-in-law Arthur Roth age 48. As I remember, the dime store run by the "two old ladies" was next door south of Palmer Jewelry store. Cannot recall the name, but it was not one of the "big name" dime stores. The Rutland Cemetery Association is holding a quilt raffle to raise funds to help with the upkeep of the cemetery. We will be drawing a winner during the Annual Rutland Cemetery Association Board Meeting at 6PM in the Rutland Village Hall. 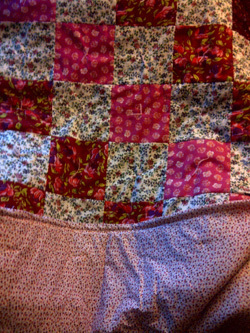 The quilt was donated by Fay Lingle of Made by Fay. Get your raffle ticket today by contacting any board member. Alan Renken, Don Benckendorf, Christy Kline, Charolette Rupe, Chris Renken, Brian Kline, Ron Thies, Margaret Littlejohn, R.G. Drummet, or Roger Weiland. I just wanted to say thanks for all the time and effort you have given to the Minonk Talk website. The new look is first class and I really enjoy looking at the photos. Thanks for bringing the memories of Minonk 3500 miles closer. I love the new format! It looks classier and is easier to navigate. Great job! My sincerest thanks to everyone who helped me celebrate my 100th birthday and to make it the wonderful day that it was! Seeing and talking to everyone was quite a joy as were the cards, gifts, phone calls and birthday wishes. Turning 100 does have it's perks! May God bless you as he has blessed me!